After Lanvin for H&M, Valentino for Gap and Lagerfeld for Macy’s, we’ve just heard about a new designer collaboration. 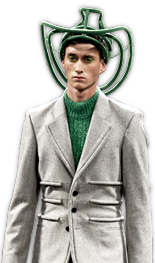 British designer Jonathan Saunders will come up with a capsule collection for Escada Sport. This will be part of the brand’s Resort 2012 collection. Saunders has been designing under his own name for five years now and has done so quite successfully. His colorful creations with unusual prints have been sold worldwide at locations such as Bergdorf Goodman, Harrods, Selfridges, Lane Crawford and net-a-porter.com. His capsule collection for Escada Sport will focus on the ‘buy now, wear now’-principle, so the items are meant to be worn on the season’s top occassions. There will be twenty pieces from different product groups, including leather accessories. Unfortunately we still have to wait a whole year; the collection will not be launched until November 2011.